Fishing Cats are medium sized cats and they have a body length between 75 and 86 cms (30 - 34 inches), a tail length between 25 and 33 cms (10 - 13 inches) and they weigh between 8 and 14 kgs (18 - 31 lbs). This species shows strong sexual dimorphism in terms of size, with males being much larger than females. They have a powerful build with a stocky body and short legs. They are grey in colour with black markings that are a mix of spots and stripes and their short tail is marked with black bands. They have webbed paws which help them move around their semi-aquatic environment and they are skilled swimmers. Unlike most cats, Fishing Cats cannot fully retract their claws. Fishing Cats can be found in heavily forested areas, jungles, scrub and reed beds near to rivers, lakes, marshes and mangrove swamps in south and south east Asia. They inhabit areas with altitudes up to 2,100 m (6,890 ft), and females have a home range up to 8 sq kms and males up to 22 sq kms. Fishing Cats mainly feed on fish, frogs, water insects, snakes, crabs, crayfish, rodents and birds. To catch their food they sit at the edge of a body of water and scoop prey from the depths with their paw. 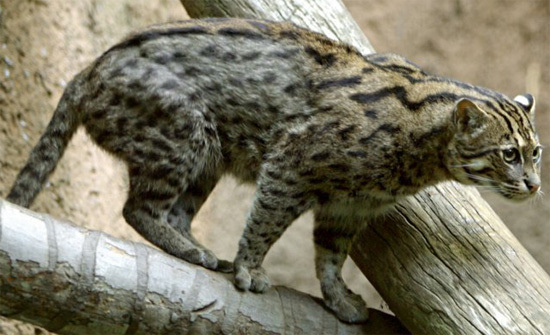 Fishing Cats breed once a year and their breeding season is between January and February. Females call to attract males and to initiate mating. After a gestation period of 63 - 70 days, they give birth to a litter of 1 - 4 kittens. At birth the kittens have an average weight of 170 g (6 oz) and they have their eyes closed. They grow quickly, and they open their eyes at around 16 days old and they begin to eat meat at 6 to 8 weeks old. The youngsters are weaned at 4 - 6 months and they are independent and sexually mature by the time they reach 10 months old. Humans are the only documented predators of Fishing Cats. Fishing Cats are one of only four cats that cannot retract their claws, the others being the cheetah, flat-headed cat and iriomote cat.